Easy care plants are a fantastic way to add some color to your home or office. Many people love succulents and any of these planters would be an awesome gift idea. Give a cute planter empty or add a succulent. This polyresin fist planter is a very unique and cool way to display your favorite succulents. It is 7.9 inches high and 4.3 inches wide. The bright blue color is sure to stand out in any room. This cute succulent planter is the perfect place to grow a whimsical fairy garden. All you've gotta do is add your own plants. This cool succulent pot is sure to look fantastic once you plant your succulents. This elegant white ceramic planter features a woven basket pattern. White succulent planters are perfect for colorful plants. This is because the plain color of the pot highlights the colors in your plants. This cool succulent planter has been designed to look like a stack of vintage books. It is perfect for displaying on a bookshelf. If you love to read you are sure to have a place for this one. These matching pots are the perfect way to display your little succulents. Each one comes with a bamboo saucer. This sculptured head cement planter features a weathered finish. It can be used indoors or outdoors. This Greek lady planter is highly detailed and suitable for both indoor and outdoor use. It is made from cement and measures 8.5 inches high. This cute ceramic succulent planter features a Japanese style floral design. It measures 8 inches in diameter and it comes with a bamboo tray. These charming succulent planters are wall mounted. There are six different styles to choose from. These planters are designed to look like girls. They are very, very cute and your plants are sure to look great in them. This is a set of two charming succulent planters that are very unique. Each one is approximately 10.5 centimeters high. These sculptured head succulent planters are made to order by an artist in Italy. You can choose the style of hair and customize other features. This cute blue fish planter is sure to look cool anywhere. It is a resin planter that features a soft, distressed finish. The planter measures 9.5 inches long, 4.25 inches wide and 5 inches high. 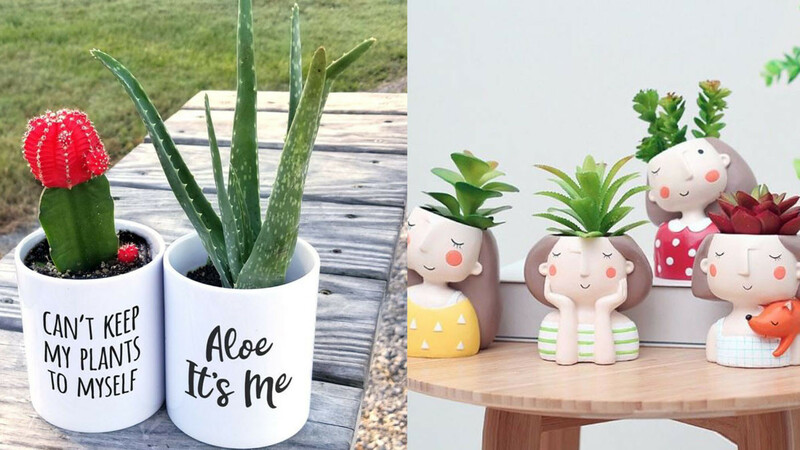 These funny succulent planters are sure to bring a smile to anyone's face. This is a great way to present a succulent as a gift. Animal succulent planters are popular and this one is particularly cool. It is handmade in Australia and painted in a striking metallic silver color. These triangular planters are grey in color and made from concrete. There is a small drainage hole in the bottom of each one. The planters are sealed so that they do not become stained. This cool succulent planter is sure to add some character to any area. It is 3D printed and it looks like a cute sloth. These beautiful ceramic quote planters are made in Australia. They are handmade using a pottery wheel and white stoneware clay. This vintage barrel planter stands 17 centimeters high. It is a unique and interesting place to plant your succulents.